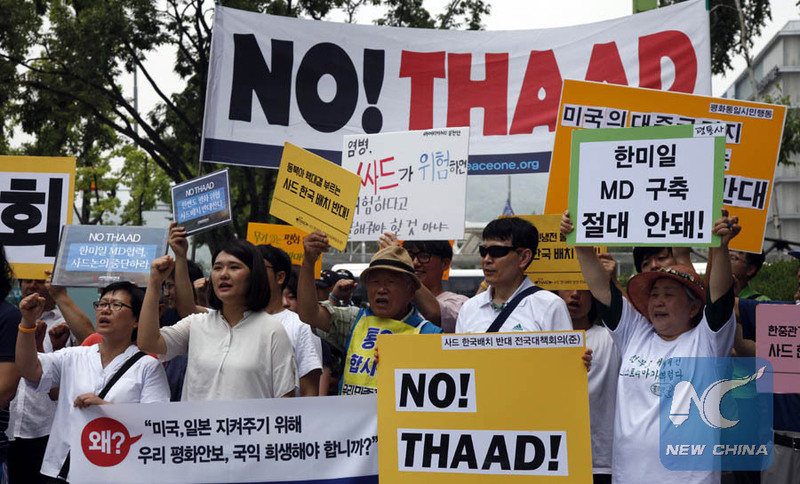 SEOUL -- South Korean people took to the streets in central Seoul on Tuesday to demand the withdrawal of the U.S. Terminal High Altitude Area Defense (THAAD) missile defense system from their home country. It was heavily raining, but hundreds of civilians and peace activists gathered at a square opposite the U.S. Embassy in Seoul, clamoring for the removal of the THAAD which they called a war weapon. Some of them wore colorful raincoats and others were lifting umbrellas. They demanded the halt of the scheduled U.S.-South Korea war game for peace on the Korean Peninsula. The joint annual military exercises, codenamed Ulchi Freedom Guardian (UFG), are slated to kick off on Aug. 21. It has been denounced by the Democratic People's Republic of Korea (DPRK) as a rehearsal for northward invasion. The war game was forecast to escalate the already mounted tensions on the peninsula, caused by the exchange of war rhetoric between Pyongyang and Washington. The DPRK test-fired what it called an intercontinental ballistic missile (ICBM) twice in July, warning the United States last week that it could strike the waters off the U.S. island of Guam in the Pacific with its intermediate-range ballistic missiles. U.S. President Donald Trump said Pyongyang would be met with "fire and fury." He noted that the U.S. military was "locked and loaded," indicating a possible military action. South Korean President Moon Jae-in stressed the importance of peace on the peninsula during his speech to mark the 72nd anniversary of the peninsula's liberation from the 1910-45 Japanese colonial rule. Moon, however, had ordered the "temporary" deployment of four more THAAD launchers to a former golf course in Seongju county, North Gyeongsang province to the southeast of South Korea. Two mobile launchers and other THAAD elements were already transported in the middle of night on April 26 to the THAAD site. The four launchers were reportedly delivered to a U.S. military base near Seongju. The Moon government said the final decision on the U.S. missile shield installation would be made after completing legitimate procedures, including the environmental impact assessment on the THAAD site. 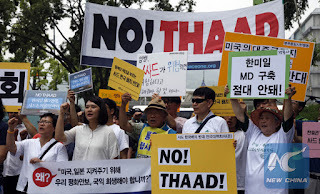 Residents near the THAAD site and peace activists claimed the removal of the THAAD from Seongju and the overall review over the deployment decision from the very beginning. The additional THAAD deployment decision stoked strong opposition from neighboring countries, including China and Russia, as its radar can peer deep into the territories of the two countries. The deployment breaks strategic balance in the region and damages security interests of the two countries. One THAAD battery is composed of six mobile launchers, 48 interceptors, the AN/TPY-2 radar and fire and control unit. Tens of meters away from the anti-THAAD protesters, female activists for women's rights sang a song to wish for a lasting peace on the peninsula. They hung a placard on their back, reading "Opposition to THAAD, Opposition to War, Supporting Peace Treaty." The Korean Peninsula is technically in a state of war as the 1950-53 Korean War ended with armistice, not a peace treaty. Meanwhile, Rep. Kim Jong Dae of the minor progressive Justice Party, and residents living near the THAAD site held a press conference in the parliament building, urging the government to remove the THAAD which they said was illegally deployed under the previous government. They said the U.S. missile shield would not become a right way for peace on the peninsula as the installation itself became the main cause to threaten peace, rather than ease tensions, in the region. 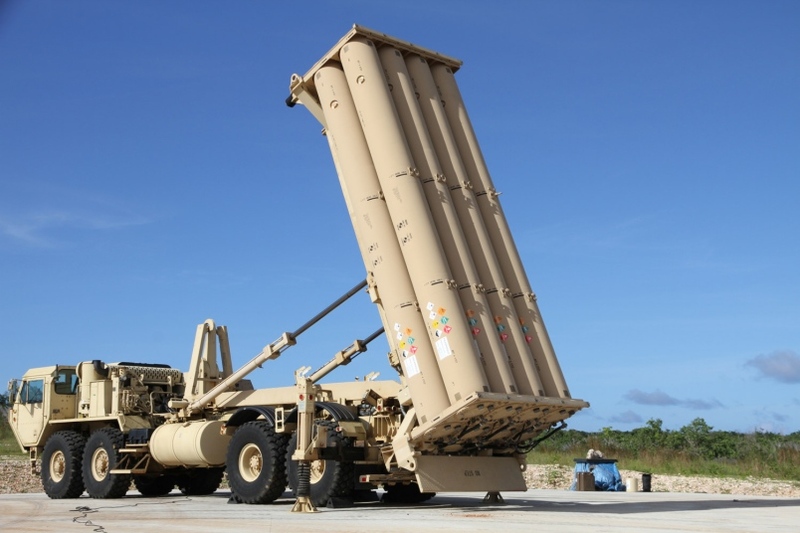 President Moon ordered the further THAAD deployment following the DPRK's missile test-launch provocations, but the U.S. missile shield was not designed to shoot down DPRK missiles targeting South Korean territory. 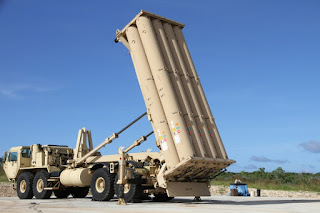 THAAD is capable of intercepting missiles at an altitude of 40-150 km. DPRK missiles targeting South Korea travel at an altitude of 20-30 km. Pyongyang also has artillery and rockets that can strike Seoul and its surrounding areas within minutes. The DPRK's ICBM is not a direct threat to South Korea as the missile has a range of at least 5,500 km.